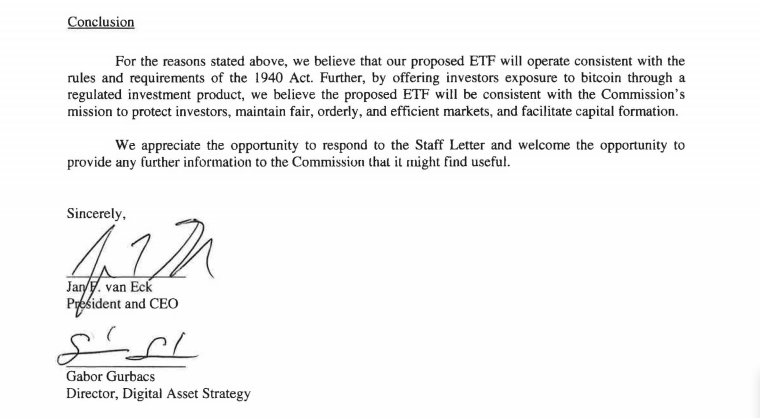 VanEck investment management firm based in New York with approximately $47 billion in assets under management have written to the SEC in a letter dated 20 July 2018 regarding the approval of BTC ETFs. The Bitcoinist reported that VanEck have applied a fresh new approach to the SEC regarding ETF approval after failing in 2017. VanEck discuss their points on one of the major issues being manipulation by stating that the concerns would be reduced with the introduction of a regulated, U.S exchange traded product such as the proposed ETF - "The Commission's increased enforcement and regulatory actions can reduce the number of bad actors in a basically sound market. A regulated fund is a natural extension of this." rules and requirements of the 1940 Act.